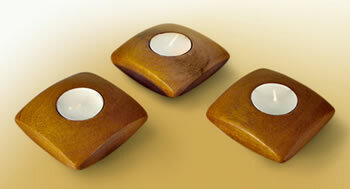 These candle holders are 80mm. square, and have been turned from Mahogany. The timber was left over from some window frame repairs carried out by a previous owner of our house. They have been finished with gloss acrylic lacquer. 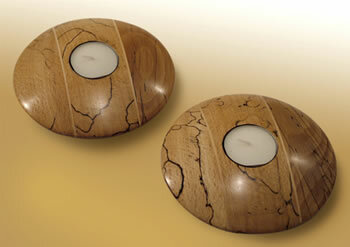 2 candle holders made from Spalted Beech, 130mm diameter. The blanks were glued up from square stock beech and 2mm layers of Bass wood. When dry, they were turned in the normal way and finished with friction polish. 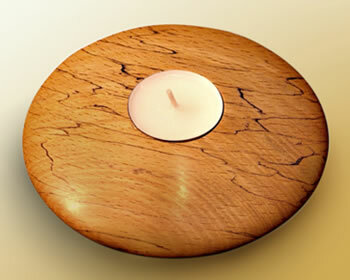 A candle holder made from Spalted Beech, 130mm diameter, and finished with beeswax. 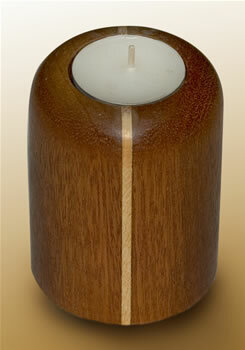 A candle measuring 70mm diameter and 90 mm tall. It was made from a 3 piece glue-up using Padauk and Basswood.